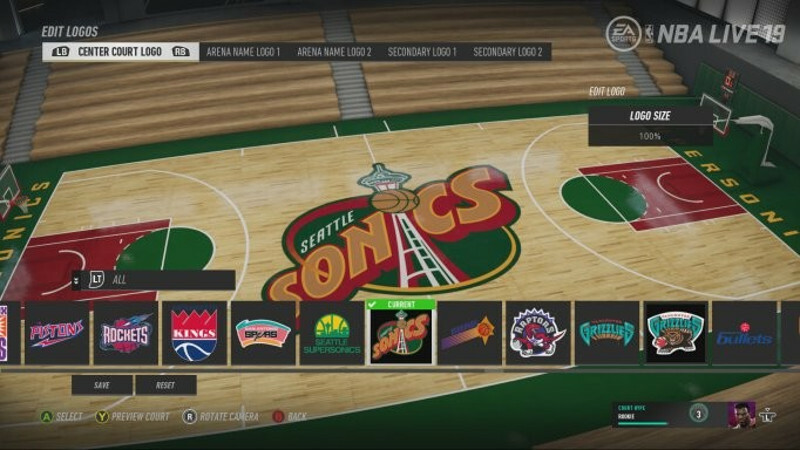 For years now NBA 2K has offered the ability to customize courts (and surrounding elements) for expansion teams and use in its online Pro-Am Mode. NBA Live 19 will introduce its own court customization, and though impressive will find the creations restricted to usage in private online games and practices in The One mode. With just over three weeks to go until release, and 11 days until the demo, EA Sports continues revealing more features for NBA Live 19’s Career Mode which was unquestionably the strength of last year’s game. Still absent though is almost anything to do with the actual NBA side of things for Live 19 including the Franchise Mode which was in dire need of attention. The first thing you’ll do when customizing your One Court is give it a name and choose a location. We have over 1,000-plus cities around the world to choose from, and we are always looking to add more. If your hometown isn’t in the game, give us a shout on our channels and maybe we’ll add it in a future update! Once you’ve got the logistics taken care of, it’s time to get creative. The easiest way to give your court a unique look is by selecting a Theme. Themes are presets of line colors, paint colors, and court textures that transform the look of your court with the push of a button. Themes can be a jumping off point to something that’s 100% your own; tweak as much or as little as you like. Change your color palette to set up the colors you can use in the rest of your creation. These are the colors that you can use on lines, court paint, logos, text, and more. As you modify, you’ll be able to see your changes update on your court in real-time. After you’ve picked your colors, you can choose a floor material for your court. From hardwood to polished concrete to asphalt, each material has its own properties that can drastically change the look and feel of your court’s design. One of the most powerful tools you can use when customizing your One Court is the use of full court graphics. You’ll start with a variety of graphics to choose from out of the gate – stuff like animal prints, camo prints, throwback 90’s patterns, and much more. 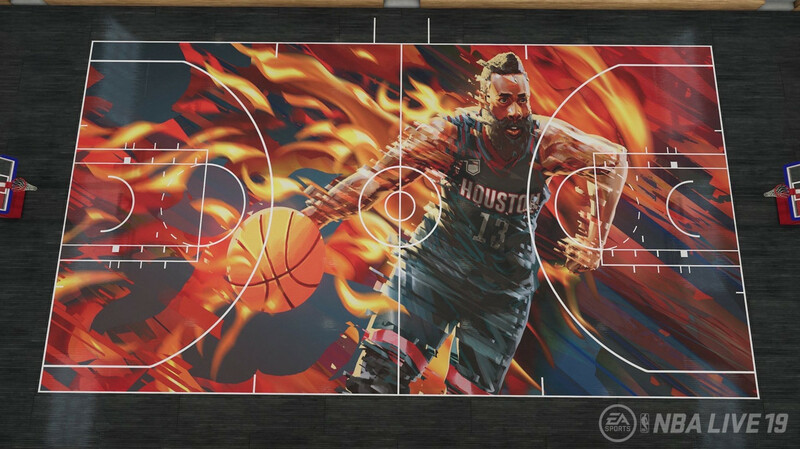 There’s also some awesome full court Player Graphics featuring NBA superstars that you can apply to your floor. You’ll be able to unlock even more by playing NBA Live 19. The other powerful tools you have at your disposal are the Floor Paint options. You can take any color in your palette and apply it to any of the nine distinct areas of the court. Each area also has its own opacity setting, letting you control how much of the court’s graphic or base texture shows through. By taking advantage of these options, countless combinations are available for you to create something unique. You can place logos at five different areas of the court (center court, both arena name locations, and two secondary logo locations inside the three-point arc). Some of these logos are also customizable and allow you to switch up the colors to match the rest of your court’s design. If you’re really into details, you can customize every line from the out of bounds line to the inner key, if that’s your thing. You can also add text to either baseline and along both sidelines, with a variety of fonts to choose from, too. Finally, you can customize the equipment on your court as well. Change the colors of the basket, the backboard pad, and the stanchion pad. You can even choose a different ball to play with! You’ll start out with just the standard NBA or WNBA ball, but you’ll be able to unlock more options (including some slick metallic ones) by playing in The League, The Streets, and Live Events. Once you’ve finished your masterpiece, save it and use your One Court to play Drills, Shootaround, or Scrimmage. You can also use your One Court to host a private run for your friends online. In NBA Live 19, our goal is to give creators the freedom to create and the power to make something that represents them. With the new One Court feature, you’ll have all the tools to put your unique court on the map.